I guessed what the ending moral of this episode was going to be about halfway into it, which is generally something that counts against a TV show for me. Not in this case, though. I think some of what Supergirl has going for it is its cheesiness — the ability for the show to be unabashedly ethical and on-the-nose with those ethics, in the same vein as its classic comic book predecessors. Comics were never awash with subtlety, after all. Not that there weren't exceptions to that generalization (there are exceptions to every generalization; that's part of this week's Supergirl lesson, too!) but as a whole, comic books tended to want their messages to get across to their readers very thoroughly. Supergirl remains within that realm of do-good, borderline-preachy philosophy. And that, I feel, is actually a point in its favor. I think the big difference between Supergirl and the shows that would try something like this episode's theme of acceptance and judging-not is that I don't doubt Supergirl’s sincerity. I don't detect the oily film of cash-in cynicism on the moral messages in "Welcome to Earth." It seems that time has allowed Kara's world to really settle into my mind, because while a lot of the lines in Supergirl's very first episode made me cringe and assume the writers had been feverishly scanning Tumblr in order to glean what issues Kids Today might have been talking about, three episodes into season two and what would have been heavy-handed lessons learned have just become part of the show's charm. After so much time building this Earth as one of hope, with Kara Danvers as the Leader of Hope, this show’s glowing optimism is as intrinsically a part of its reality as space aliens and laser eye-beams. It’s all still more than a little cheesy... but I have officially become immune to the cheese. Hey, Coma Dude is finally part of the actual episode now that he has awoken from his coma! Just a pity that his first act upon waking is to strangle Kara, break a bunch of stuff in the DEO headquarters, and then flit away at superhuman speed. Say what you will about his extreme reaction to waking up, but he had a pretty impressive learning curve for those powers. Most people hesitate at least a little before committing acts of self-defenestration, but Coma Dude was like, “Nah, it’ll be fine,” and I can respect that. Even though Kara seems like she wants to give him the benefit of the doubt, everyone around her has decided that Coma Dude probably needs to be taken out. This is the introduction of the Theme of the Episode, which is all about xenophobia and prejudice. To add to the theme, the President of the United States is planning to sign a bill giving aliens amnesty and a lot of people — including J’onn and Alex — think it’s a bad idea. Because Kara is both an optimistic ray of light, she is very much pro-amnesty. Because she is doomed to learn a lesson by the end of the episode, she’s kind of judgey about it. Things are looking bad for Coma Dude’s innocence when President Wonder Woman almost gets immolated by what appears to be a Kryptonian heat vision beam. Well, everyone on the show thinks it “appears” to be a Kryptonian heat vision beam — I’m pretty sure everyone in the audience knows that Kryptonian heat vision beams don’t look like waves of fire. They look like beams. Or, more precisely, they look like fiery eye-lasers. The characters haven’t studied the distinct special effects associated with Kryptonian heat vision beams, however, so it’s another strike against Coma Dude. Strike number three comes when Winn figures out that the guy is actually from a planet called Daxam, which fought a war with Krypton that led to a long-standing feud between the two planets. 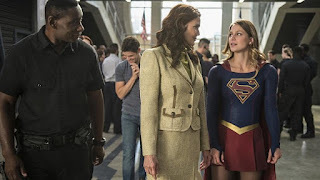 Here’s where Kara’s earlier judginess comes back to bite her, as she instantly decides that this Daxamite visitor must be well and truly evil, just because he’s from that particular planet. She has him thrown into the DEO prison, but when another attack on the President happens while he’s still locked up she has to admit to her own prejudices. Just goes to show that even Supergirl isn’t above learning the lessons of Supergirl. The real enemy turns out to be someone who shoots fire and doesn’t like Alien Amnesty because... it might mean having to pay taxes? The cool Alien Bar where she hangs out could get overrun with hipsters? It’s fun to set things on fire willy-nilly, without regard to federal law? Whatever. At the point of writing this review, I don’t really remember the exact reason why Flame Lass decided to try barbecuing the President of the United States, but it doesn’t matter because Kara stops her anyway. Well, Kara stops the fire part of the fiery villain and then Maggie Sawyer kicks her in the face. Teamwork! Kara’s still trying to be a reporter, and honestly I would be bored of this storyline regardless, but the inclusion of Snapper Carr just makes it agonizing. He is an awful character and I know they’re trying to present him as a gruff, no-nonsense mentor for Kara, but no. Just no. Cat Grant was a gruff, no-nonsense mentor for Kara — Snapper Carr is just the worst. He will always be the worst. I'm saying it now: I will never like Snapper Carr. I have a prejudice against insufferable jerkwads and even the moral lessons of Supergirl cannot tear that prejudice from me. The only good part of this B-plot is that Kara’s assignment is to interview Lena Luthor about her opinion on alien amnesty — particularly in regard to a device that L-corp is developing that could help differentiate aliens from humans. I find Katie McGrath so charming as Lena Luthor that the reporter storyline is worth it, so long as it keeps delivering scenes with her and Kara. Why couldn’t Lena Luthor have been Kara’s editor at CatCo? I’d be way more into Kara’s journey as a reporter if it were Lena Luthor guiding her, even though I know that Lena’s going to turn out evil eventually. Instead, Kara writes a hatchet job on Lena Luthor’s Alien Detector that is then shot down by Snapper Carr for being too biased. When Kara learns the lesson of the A-plot, she rewrites the article in a less slanted way and feels like she’s accomplished something, thanks to Snapper Carr. Blegh. Snapper Carr contributing to the plot leaves a terrible taste in my mouth. "For the record, she's the one who's lucky to meet you." "Thanks... Should I get a blow-out?" "Oh dear God." J'onn J'onzz dealing with his adopted alien daughter is my new favorite thing. “It’s hope, J’onn. How can it be false?” “Did you hear that?! That was like a legit quote. People are gonna quote her!” Hey, Supergirl, that really was a great quote and all, but you’re toeing the line of smugness with the follow-up. “I flew here... on... on a bus.” Superheroes are so ironically bad at lying. Kara and Lena’s first scene really did remind me a lot of early Clark and Lex from Smallville. Just, you know, without the five minute monologues on Greek mythology. I might dislike Winn, but Jeremy Jordan’s line delivery when he says “You are already gone!” was perfect. Although it didn’t fit into the main body of my review, don’t think that I’m not looking forward to future Alex/Maggie happenings. "Make smarter choices next time." "Yes, ma'am." Hee. Best sisters. I’m not totally on board with Alien Bar. It seems like one of those things the show could start using as a crutch, if it’s not careful. Two whole worlds fought a bloody war and only "thousands of lives" were lost? Those are actually good numbers, by Earth standards. “I need the new Apple TV.” No one needs the new Apple TV, dude. No one needed the old Apple TV. Okay, I like when Snapper Carr is around as long as James Olsen gets to tell him off. "You ought to see my other jet." Remember when I said that I was immune to the cheese early on in this review? Yeah, after that Invisible Jet reference, I think I've got a little lactose intolerance left in me. Flame Lass (?) was against the amnesty act, because she saw it as a way to get aliens to come out of hiding so the government would know who and where they are; she compared it to registration.